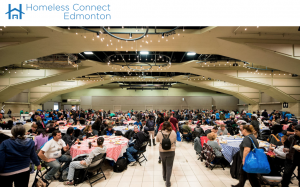 Volunteer for Homeless Connect at the Shaw Conference Centre in downtown Edmonton on April 29. It’s a community-inspired initiative, providing free services to people experiencing homelessness or at risk of becoming homeless, on one day and at one location. Twice a year, with the support of our sponsors, service providers and volunteers gather to help more than 2500 guests create paths out of homelessness.